Most United States coins are dated the year they are minted. 2006 dated American gold eagles and silver eagle coins in late 2005. This gives them enough time to make a small quantity for issuing in early 2006. Then by the end of 2006 they have discontinued making the 2006 dated coins. year that is stamped on the coin. In most all cases when a new year begins, newly minted coins will have the new year on them as the date. Because of this unwritten rule, collectors can expect that no more coins of the previous year will be minted. Sometimes this causes immediate price increases due to known low mintages. 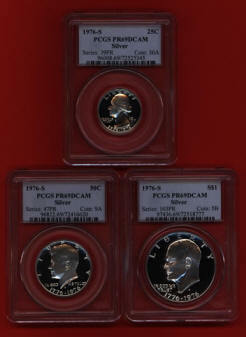 (Example – the 2004 clad proof sets.) US coin collectors and investors have a sense of security that the government won’t overproduce any certain year. Most world government mints follow the same process. However, a few countries have been known to continue making a certain date after the year ended, because they thought they could profit by higher prices. Usually, such action by a government mint is self-defeating, because many collectors will then discontinue buying coins from that government. There are a few instances where US coins were produced after the date on the coin. In 1964 speculation in silver prices caused silver to rise rapidly in price. 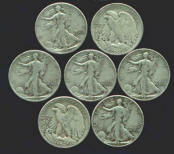 People began hoarding silver US coins that were circulating at the time. Congress, in order to try to stop the hoarding, authorized the mint to continue producing these 90% silver coins by dating them all with the year 1964 on them. Near the end of 1965 new nickel clad coins (not 90% silver) were introduced and dated 1965. Because the hoarding of silver coins created an unusual demand for coinage, the mint ran about 6 months behind on changing the dates of its’ coinage. By 1967 the mint was back on schedule and returned to dating coins in the year that they were minted. The Bicentennial – big demand. It’s not unusual for the US mint to produce coins prior to the year of release and not issue them until the date on the coins. However, there was one time in US history where things were done differently. The United States of America bicentennial in 1976 was a big event. The US Congress authorized the mint to make a special bi-centennial reverse design for the quarter, half dollar, and Eisenhower dollar coins. Rightly so, the mint expected a big demand for these coins and began minting and releasing these coins in 1975 with the symbolic date, 1776-1976. These bicentennial coins were produced and released for two years, 1975 and 1976. (Consequently, you won’t find a quarter, half dollar, or dollar coin with the date 1975 on it.) After 1976 the mint returned to its original designs and dated the coins in the year of issue. You may remove items by clicking on the View Shopping cart button. Click checkout to use PAYPAL to pay with your Visa or Master Card. You may also email us your order. We accept money orders, cashiers check, or personal checks as payment. Thanks!